I received a nice surprise this week. 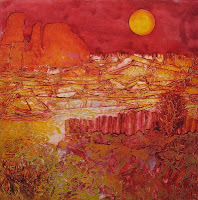 I entered several pieces into the local Dogwood Show at the Atlanta Artists Center in Buckhead and received an Honorable Mention for my collagraph print called "Under the Hot Sun". 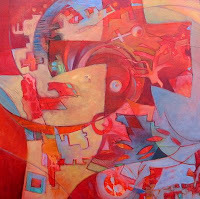 My acrylic painting called "Abstract in Red" was also accepted. The opening reception will be held Saturday, April 11 from 5-7 PM at 2979 Grandview Ave. Atlanta, GA 30305. The exhibit is on display from April 7 - May 1. Hours Tuesday - Saturday: 10 am - 4pm. Congrates to you too.I didn't realize you had won an Honorable Mention also. We both got a representational and abstract into the show. Guess I need to come to the reception so we can support one another!BTW my award was on a realistic oil painting of rocks and not on the one that's featured in the current post. Love your work and honored to be "hanging" with you! Congrats! That is wonderful and well deserved. Enjoy the show and the opening reception. Hope it has a great turnout and much success. 'Under the Hot Sun' is a great piece - I can see why in got an Hon Mention. Love the patterns and textures. Congrats! Such nice comments. Thank you.